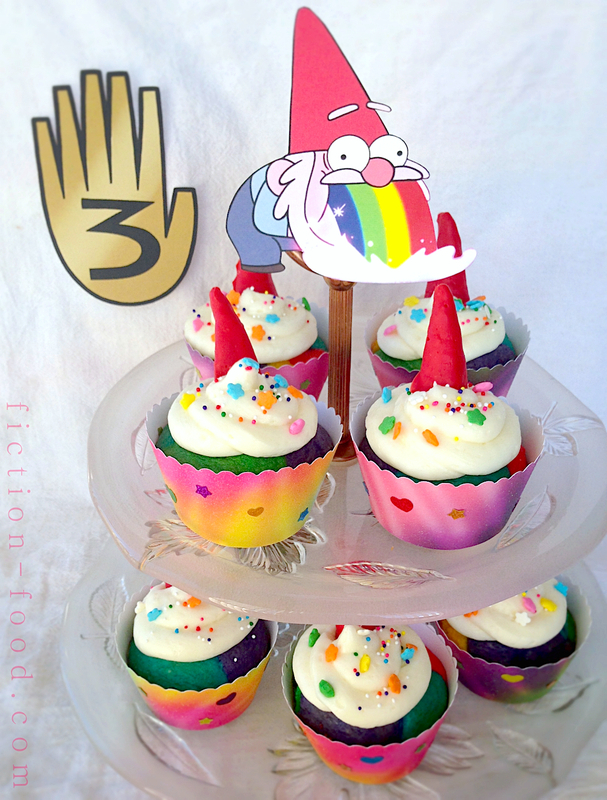 Fiction-Food Café: Gnome Puke Cupcakes for "Gravity Falls"
Gnome Puke Cupcakes for "Gravity Falls"
"Gravity Falls" is a totally fun and clever animation series created by Alex Hirsch that aired on the Disney Channel (2012, season 1) and will now air on Disney XD starting this summer (2014, season 2). The show is inspired by the summer vacation experiences–and dreamed of experiences–of Alex and his twin sister Ariel. I think this show is flapping awesome and have been so craving more episodes! I can hardly wait for season 2. There is so much mystery and humor and thoughtful continuity from episode to episode. There are even messages to decode at the end of each show! 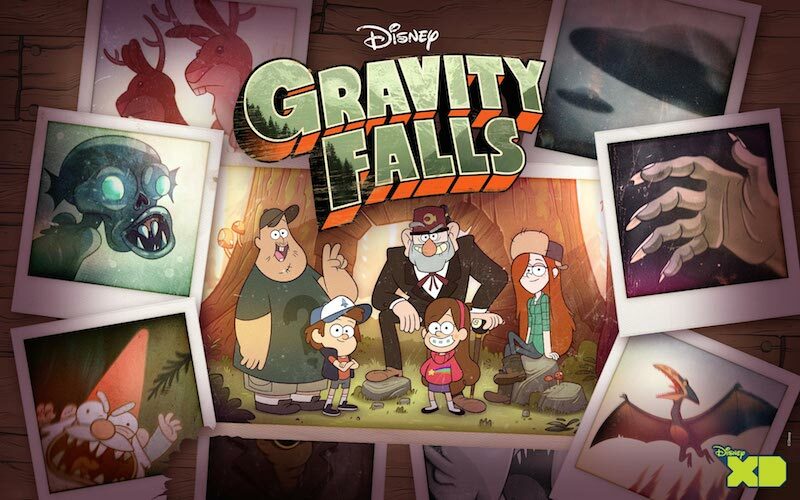 "Gravity Falls" is a smart series that you can tell is the product of much effort and deliberation behind the scenes. 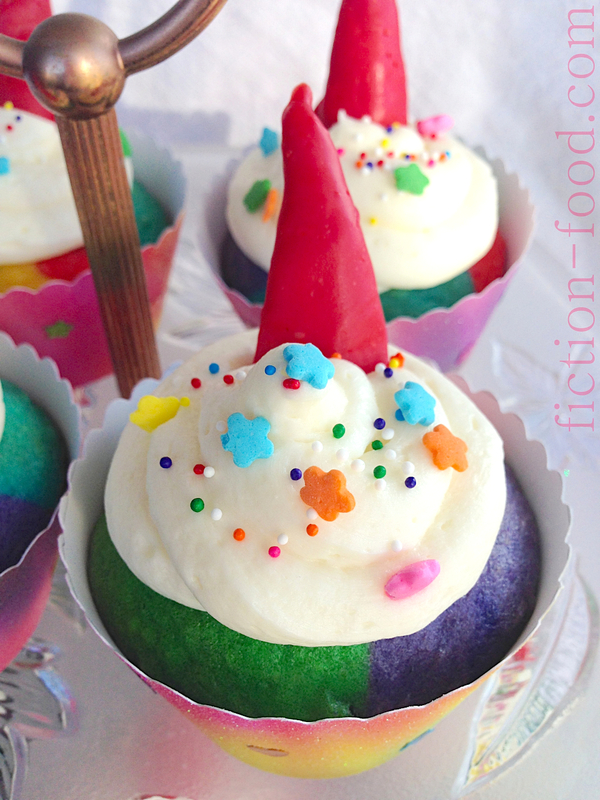 These cupcakes are inspired by a scene from "Tourist Trapped" (s.1, ep.1), in which a gnome throws-up a rainbow after getting punched or kicked by Mabel, one of the main characters. Well, it's barf that resembles a rainbow (see video clip below). 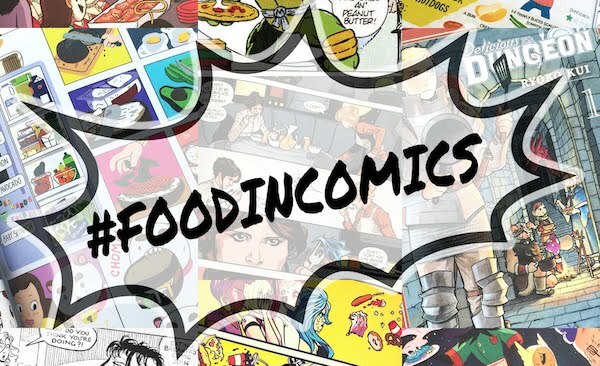 The gnome puking scene is so popular it's been made into T-shirts and other items and even won a spot on the Food Fiction Wikia's "Gravity Falls" Menu! Note: I made five colors of batter for my cupcakes, but you'll notice that the gnome is only puking four colors (purple, green, yellow, red) so you can totally go either way. You can see in the photos that I forewent cupcake liners and created rainbow cupcake wrappers instead. 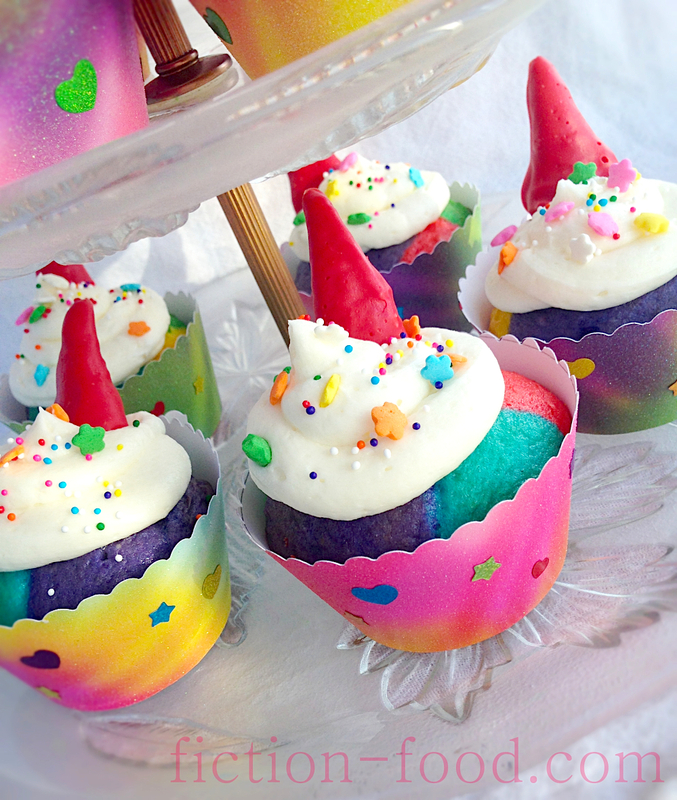 Instructions for the wrappers are found below, but if you'd rather use cupcake liners just make sure they're rainbow! Also, I chose sprinkles to decorate the cupcakes and heart and star stickers for the rainbow wrappers to Mabel-ize the cupcakes, 'cause, you know, those little guys are in to her! and I thought she would approve. Mabel loves stickers and magic-glam! 1. Preheat oven to 325ºF. Prepare the cake batter as directed on the package & then separate it into several smaller bowls, equal to the number of colors you're going to use (I chose 5 colors but the gnome's puke is only 4). Using a clean spoon for each, stir in enough gel coloring to make vibrant colors. Grease your cupcake tins very well with shortening or butter. Spoon small amounts of each color into the cupcake cups, using a clean, second spoon to scrape each colored dollop in. Bake on the middle rack for a little bit longer than the box calls for, until a toothpick inserted into the center of one of the cupcakes comes out clean. Remove the tins from the oven & let cool for a few minutes. Gently remove the cupcakes from the tin & place them on a cooling rack or towel to cool completely. 2. Line a tray with waxed paper. Heat the candy melts in a microwave safe bowl for 30 seconds & then stir. 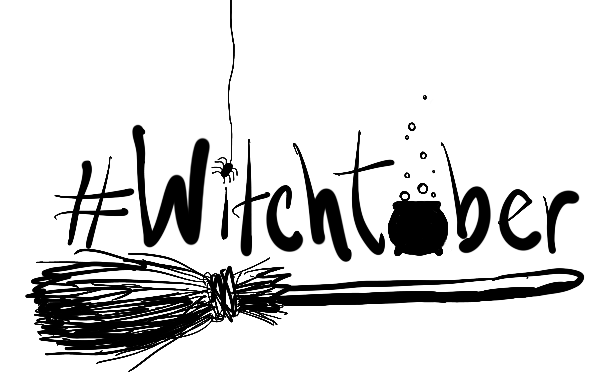 Repeat until the candy is completely melted (heating in small increments & stirring). Stir in a small amount of canola oil for smoothness & dipper-able-ness. I mean dip-able-ness. Pick up a non-broken bugle by the wide end & dip/roll it in the red melt until completely coated. Let any excess red fall back into the bowl & then lay the coated bugle on the wax paper. Repeat this for as many bugles as you have cupcakes. Let the coated bugles sit undisturbed until hardened. 3. Make the buttercream frosting if you're going homemade (recipe here). Spoon the frosting into the decorating bag (or baggie) & cut out a medium-sized hole at the end. Pipe frosting onto each cupcake in fat swirls, not worrying about getting to the very edges (so the colors show). Sprinkle (& place by hand if necessary) colored sprinkles over the frosted cupcakes. Carefully peel the dipped bugles off the waxed paper & stick them upright (point up) on top of the frosted cupcakes. If you'd like to drop these cupcakes in pretty wrappers, follow the instructions below. 1. Print & cut out the wrapper template. Place 1 sheet of rainbow paper face down on your work surface & trace the template as many times as you can, beginning at a bottom corner (I was able to trace 6 times). Cut the tracings out & them use the special-cut scissors to create a decorative top edge (the long edge). Repeat these steps with the second (& possibly third) sheet of rainbow scrap book paper, until you have as many wrappers as you have cupcakes. Stick several sparkly stickers onto each wrapper. 2. Fold a wrapper around one of your cupcakes & mark (with a pencil or simply by holding it) where the wrapper needs to close in order to fit somewhat snuggly around the cupcake. Use this wrapper as a guide & measure & mark the rest of the templates where they need to close. If the rainbow paper you used is not covered in glitter, stick a couple pieces of double-sided tape on the backsides of the wrapper ends opposite the mark & then fold the wrappers around to meet the marks & press closed. If your rainbow paper is coated in glitter (like mine), cut the wrapper end off about 1/4"-1/2" close to the mark & then snip halfway up the wrapper at the mark. On the opposite wrapper end snip halfway down about 1/4" in from the end. Fold the wrapper ends around to meet & slide the snips together (see photo above) to secure the wrapper. Plop the cupcakes into the wrappers & enjoy! 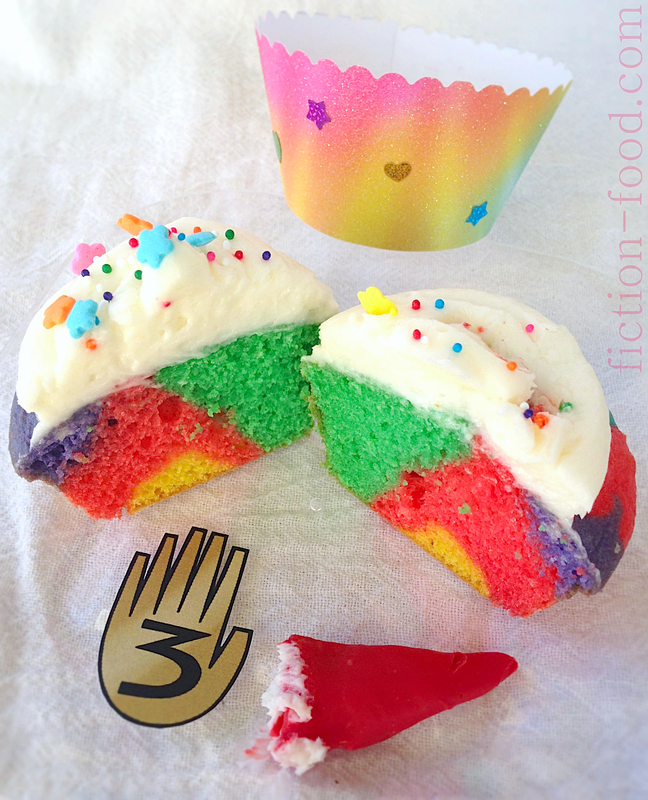 * Wanna toothpick 6-fingered hands (from the cover of Dipper's Journal) into your cupcakes? Thanks! I love this show! This is so cute ! You should make mabel-juice from the episode sock opera ! Haha, I don't think I could handle all of the caffeine that I imagine is in there! But knowing Mabel it's probably made from a red Cool-Aide + sugar + water, Pitt Cola minus the peach pit (you can use Crush, Nehi, or Fresca peach soda), Smile Dip (Fun Dip in our world, which is the same as Pixy Stix), and a couple of 5-Hour Energy shots, stirred together with a few ice cubes and tiny plastic dinos. I'm so tempted to make it! But I can't do those caffeine drinks. If you make it let me know!